You have decided who is going to print your directory, have received a quote and realized quickly that printing is expensive! Can you have a professional looking printed directory that is budget friendly too? The answer is a resounding YES! It is important that your directory software has printing and page selection options. The Instant Church Directory gives you the best of both worlds- awesome online and mobile app experiences, and the ability to choose exactly how you want in a printed directory. With the Instant Church Directory, you can choose a format for displaying pictures and which page options to include in the directory. Is this a once-every-5 year directory? If so, you will want to use a more durable paper. If you are updating and reprinting the directory frequently, a cheaper paper grade can be used. Most copy machine paper is 20#. 20# paper, although not as durable, is fine for a self-bound (presentation folder) directory. This will most likely be a directory that will be updated frequently. Presentation folders easily allow for updates. I printed sample directories using 24# and 28# paper. This is more durable, however, more expensive. The binding options include coil, comb, saddle stitch, and self-binding. The coil and comb bindings are a bit pricey, (around $5/book), but are the most durable. When combined with a plastic cover, these are the most professional looking. Both bindings will allow the directories to open flat and accommodate as many pages as you need. A much less expensive binding is saddle stitch. The name is deceptive – this binding does not require any ‘stitching’. The pages are folded with the staple inserted in the center of the fold. Fed Ex charges $0.25 per book for saddle stitching. Directories can be opened flat, but durability is lost when members open the directory to a page, then fold it backward in half. Also, this binding is best for books of 60 pages or less. The most economical binding option is a report cover. Be sure and use a clear one so that your directory’s cover picture can be seen. Self-binding takes more time, requiring someone to punch holes into the pages and insert them into the folder. However, this option is the most economical and most versatile – you can easily make updates to the directory. 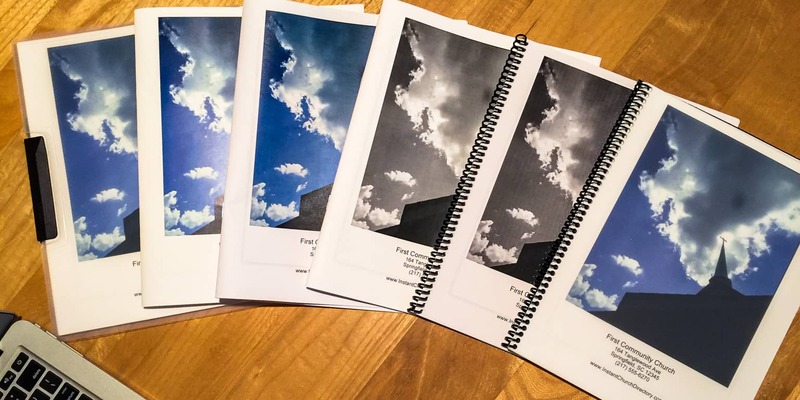 Both front and back covers can be produced in a variety of ways. The plastic cover is most professional looking, and consequently the most expensive. You can also use cardstock or a heavier paper for a nice less expensive look. The ink choice – black and white or color print – will ultimately determine the cost of each directory. Although color ink looks nice, it is also the most expensive. The price is determined by cost per impression, not cost per page. This means that for double-sided printing, you will be charged once for the front of the page and again for the back. The least expensive way to print is using black and white ink. 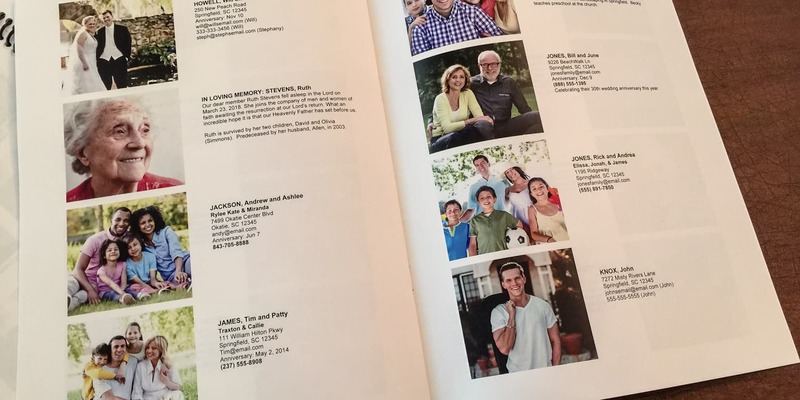 Many congregations like a directory with color pictures. Choose a directory company, such as Instant Church Directory, with multiple printing options. 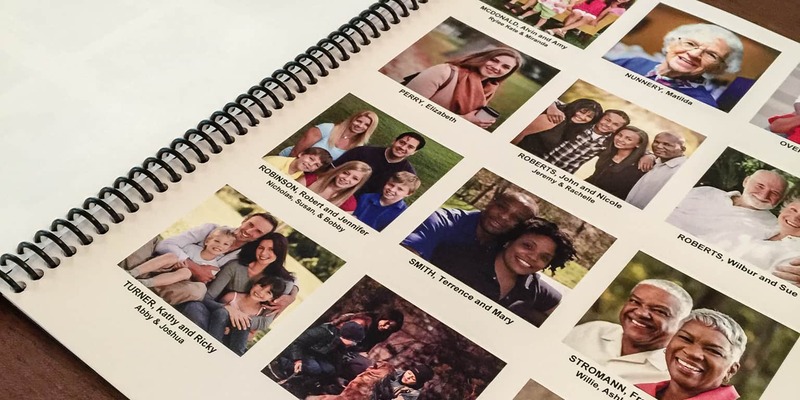 To save on color printing, generate the directory using the ‘photo directory pages’ and ‘roster pages.’ This will give you 12 smaller images per page which can be printed in color. Then, print the roster pages in black and white. So, now that you have information overload, what is the most cost-efficient way to print your directory? Use the options! 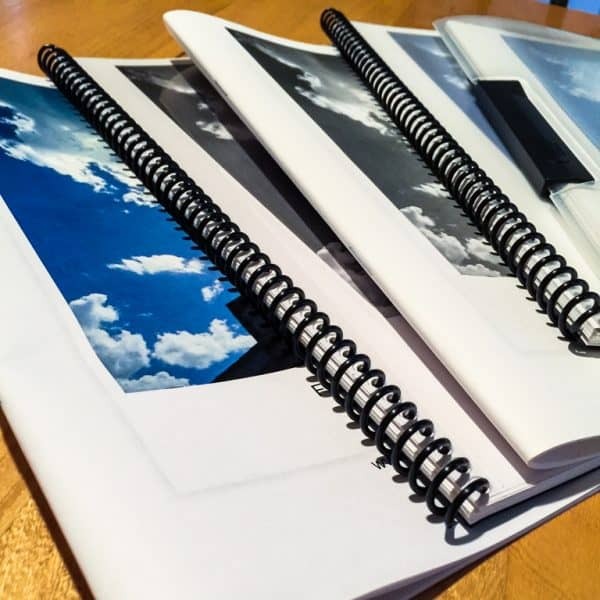 First print the cover page in a higher weight paper, then print the photos in color. Print the rest of the directory using black and white ink and self-bind the directory. Second, more people are using smartphones and will access the directory information electronically. Because of this, many times printed directories are looked at once then put in a drawer. Print a copy of the directory for your members who cannot access it electronically, then encourage your other members to move to the apps. Finally, know that the ultimate purpose of a directory is to facilitate communion within your church. The materials chosen are not as important as the results – your church body connecting with each other and getting to know each other on a deeper level.